Halle/Leipzig. Starting in September, the Deutsche Forschungsgemeinschaft (DFG, German Research Foundation) will be supporting a new Priority Programme for rhizosphere research with €6 million in funding. It will be coordinated at the Helmholtz Centre for Environmental Research (UFZ), with 18 German research institutions involved in 25 projects. The objective of the interdisciplinary consortium is to investigate what degree of importance interactions between roots and soil have for water and matter cycles in the environment. The researchers aim to demonstrate that the rhizosphere is a self-organised system which withstands disturbances on its own. The rhizosphere - the region of soil directly impacted by a living root - is at the heart of the DFG Priority Programme that is now under way. 3D representation of the age distribution of the root system of a 16-day-old plant that was grown in a soil column experiment. The root system is superimposed on a map that indicates the Euclidean distance to the nearest root surface for each point in the soil, i.e. the distance that nutrients, water and organisms need to travel to the nearest root surface. The key objective of the Priority Programme is the systemic evaluation of roots and soil as an integrated system. More specifically, the researchers will investigate local interactions between roots, micro-organisms and soils which translate into macroscopic properties such as patterns in the spatiotemporal configuration of physical, biological and chemical parameters. These patterns influence numerous processes in the root-soil system, such as the absorption of water and nutrients, carbon sequestration and the health of plants. In many cases, these patterns are still not well understood. In order to address these gaps, a total of 25 research projects from a variety of disciplines - from microbiology and plant genetics to soil chemistry, soil physics and modelling - will get under way under the auspices of the Priority Programme. 18 German research institutions are involved in the consortium. Aside from coordinating the entire project, UFZ is contributing its expertise in soil system research, soil ecology, and analysis as well as ProVIS (Centre for Chemical Microscopy) and the experimental research station Bad Lauchstädt in several individual projects. "Even though rhizosphere processes take place on a very small scale, their effects are of key importance for two major global issues," explains Prof. Doris Vetterlein, agricultural biologist at UFZ and coordinator of the programme. "The rhizosphere is not only the place where plants acquire resources but also where carbon enters the soil. Our research interests are highly relevant not just to food supply issues but to the absorption of greenhouse gases as well." 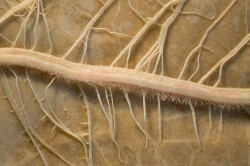 The rhizosphere is the region of soil directly impacted by a living root. It is the habitat for countless organisms, including fungi, bacteria and nematodes. Plant roots release various organic compounds into the soil. These compounds change pH values, mobilise nutrients and form a special community of micro-organisms made up of bacteria and fungi. As plants develop, their roots are constantly exploring new areas of the soil and therefore continuously accessing nutrients and water. A particular feature of the rhizosphere are the steep gradients of the chemical, biological and physical parameters. This means that an extremely diverse range of living conditions can be found for the different organisms in a very small amount of space. The researchers use standardised experimental plant and soil types so that the results of the projects are comparable. The experimental plants are two maize genotypes. Maize is suitable for two reasons: Firstly, the genome of the maize plant has been fully sequenced. Secondly, a mutation isolated from its natural environment exists which develops root hairs, however these do not elongate. Hence, by comparison of mutant and wild type which forms normal root hairs, it is possible to study the impact of spatial parameters in depth. A sandy soil and a clayey soil are the soil types used. At the UFZ experimental research station in Bad Lauchstädt, a test field is being installed which all partners will use collectively. In the specially prepared field with a surface area of 4,000 square metres, the experimental plants will grow in both soil types, shielded from other plants by a root barrier. 2,500 tonnes of soil will be transported in 125 lorry loads. Soil column experiments will also be carried out to investigate the early development stages of the plants. The maize plants will grow in cylinders measuring around 25 centimetres in height and seven centimetres in diameter. In this system the roots that would otherwise not be seen will be made visible during growth. The key analytical tools for examining the spatiotemporal component are two- and three-dimensional imaging techniques. They aim to investigate where and when the elementary processes take place in the rhizosphere, such as nutrient and resource transport as well as communication between plants and micro-organisms. Various state-of-the-art techniques will be used in the project, depending on the scale of the parameter to be investigated. 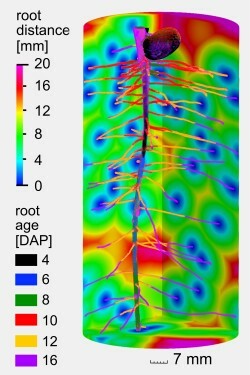 Computer tomography is the method of choice for making the natural root structures in the soil visible. Neutron radiography and magnetic resonance imaging are effective for illustrating water transport processes. Selectively marking microbial strains with fluorescent dyes will allow the researchers to specifically investigate the role of micro-organisms in the rhizosphere. Another important aspect of the Priority Programme is internal knowledge transfer. 23 doctoral students are utilising the project for their doctoral research. Furthermore, six workshops are planned over its three-year duration which will promote further training and scientific exchange in addition to networking between participating researchers. In the workshops, to which internationally renowned researchers will be invited, there will be lectures and practical seminars, for example on setting up experiments, imaging techniques, statistical methods and modelling. Priority Programmes (SPP) are a thematic funding instrument of the Deutsche Forschungsgemeinschaft (DFG, German Research Foundation). They are normally 6-years ( two times 3-years) research programmes of a consortium of German research institutions. They are expected to create significant momentum for the further development of science on the basis of coordinated, geographically dispersed funding of important new areas. There is currently a total of 97 SPPs being funded. The last Priority Programme of the DFG for rhizosphere research was in 1989. In September 2018, "Rhizosphere Spatiotemporal Organisation - a Key to Rhizosphere Functions" (SPP 2089) will get under way.